Last weekend records fell like trees at the Cross Town for Crosswinds in Sussex. In the 5-km new records were set for both men and women as Bryan Thomas bettered his own record with a 16:45 while Mary-Beth Jaillet set a new women’s record at 20:59. At 10-km Sacha Hourihan beat her own record with a 36:58. In the half marathon Trevor Funk set a new men’s mark at 1:17:12 while Adrienne Fullerton eclipsed her own record with a 1:39:15. Second place in the men’s half marathon went to Liam Funk of Saint John in 1:35:59 and third to Pat O’Brien of Moncton in 1:37:55. For the women second place went to Kalyn Sharma of Picadilly in 1:47:09 and third to Julie Brown of Quispamsis in 1:48:38. An amazing day of racing. In Fredericton at the Runway 5K Run the men were led by Fredericton’s Nikolay Ryabkov in 18:16 followed by Donald Evans of Oromocto in 18:33 and Tim Weibe of New Maryland in 19:24. Rebecca Dolson of Richibucto Road was the top woman in 19:34 followed by Fredericton runners Donna Trites (21:12) and Kelsey Tucker (21:23). The third running of the R.a.T.Race in Saint John was a family affair as Shelley Doucet of Quispamsis (29:09) and husband Evan Doucet (29:50) were the top male and female runners on a tough trail run in Rockwood Park. Glenn Trites was the second male in 30:34 followed by Brent Marr in 35:13. Marcie Holland took the silver spot for women in 37:47 followed by Sarah Holland in 44:18. This week our Person on the Run is a Team on the Run with a pretty impressive record at the Cabot Trail Relay. The Fredericton Trailmasters have won 4 out of 5 years as a team including this year’s version. Congratulations on another great year. Last weekend the Run for Renee had some excitement in Quispamsis. Two men eclipsed the previous men’s record as Evan Arsenault went one second under with a 15:34 and Matt McNeil of Halifax (but a Saint John native) nailed a new record that will be hard to beat at 14:47. The women’s record also took a beating as the current record holder Sacha Hourihan did herself one better with a 17:35. Third place for the men went to Kevin Curnock in 17:32 while on the women’s side Claire Oliver was second in 21:24 and Suzanne Doucet third in 22:13. Overall 11 personal bests were set in that race, it shows how a fast front runner can pull the entire field to better performances. 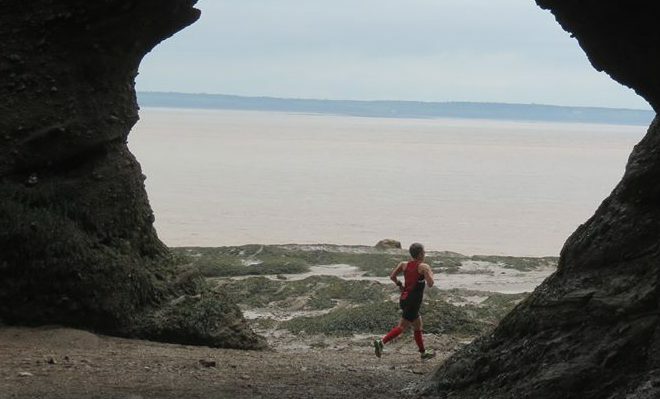 At Hopewell Rocks the Hopewell Rocks 8-km Multi-Terrain Race had a record registration of over 200 runners and the results were great. In the men’s race Kevin Heppell of Charlo led the way in 39:23 ahead of Jason St-Onge of Moncton in 39:45 and Jeff MacPhee closely behind in third at 39:48. The women’s event was won by Maggie McClure of Halifax in 41:07 followed by Renee Embree of Saint John (41:48) and Melanie Hamill of Wellington (43:12). At the Rompin Rockwood the 50-km went to Andrew Jarvais of Oromocto in 4:57:17 for top spot ahead of Eric Girard (5:32:48) and Joel Monsvelt(5:43:33). For women to Kelsey Hogan of Steady Brook NL in 6:09:24 followed by Krista Kierstead in 7:20:02. The 25-km was won by Eric Mauricette of Baileyville in 2:20:00 for the men ahead of Michel Poirier (2:25:57) and Trevor Nason (2:25:59). Marcie Holland of Saint John took top spot (2:45:20) for the women followed by Rosanna Lamb (3:00:58) and Sheryl Hiemstra(3:04:45). Also in Rockwood, the R.a.T. Race had its’ second running and no surprise, Shelley Doucet led the way for the women (and overall) in 28:43 followed by her sister Marcie Holland in 37:29 and Sarah Holland in 47:35. The men were led by Shelley’s husband Evan Doucet in 33:15 ahead of Brian Head (34:49) and Brent Marr (34:49). Congratulations to all finishers, it is nice to see a weekly trail running opportunity in Rockwood. This week our Person on the Run goes to Sacha Hourihan for once again setting a new record for the Run for Renee with a blistering 17:35 finish, great work. ahead of Emily James of Rothesay (3:02:11) and Maura Wierczorek of Halifax (3:10:07). The women’s half marathon was a tight finish as Morgan Hawkes (Halifax) won in 1:31:31 ahead of Charlottetown’s Daun Lynch (1:31:42) and Jennie Orr of Halifax (1:32:07). The men’s event went to Lee Wesselius of River Glade in a new course record 1:11:09 followed by Richard Sukiennik of Bangor in 1:14:22 and Adam Kellar of Guelph in 1:16:57. The 10-km saw another record fall as Shelley Doucet of Quispamsis ran an incredible 35:57 for top place among women and third place overall. Second place went to Rochelle Johnston of Moncton in 39:50 and third to Melanie Loveridge-Spinney of Hanwell in 40:57. For the men hometown boys took the top two spots as Lars Schwarz ran a 34:56 and Justin Young a personal best finish in 35:26. Third place went to Bryan Thomas of Nord Tetagouche in 36:49. The 5-km for men went to Francois Richard of Dieppe in 17:46, second place to Chuck Dixon of Sackville in 17:54 and Zachary Boulanger of Saint John was third in 18:02. In first place for the woman was Rebecca Dobson-Edge of Fredericton in 20:14 followed by a pair of young runners, Madeleine McLeod of New Maryland (20:31) and Claire Oliver of Grand Bay-Westfield (21:34). The 3-km event went to another hometown girl Kelsey Tucker in 12:06 for the women and Aaron Sellars of Moncton in 9:56. The one-miler was crazy fast with Emily Trites of Fredericton leading the way for women in 5:14 while Michael Colford of New Maryland was exactly a minute faster in 4:14. This week our Person on the Run goes out to a guy on a long run indeed. This past weekend in his first 100-mile race Tim McDonough of Saint John took third place at the Riverlands 100 in Maine. Great work Tim. 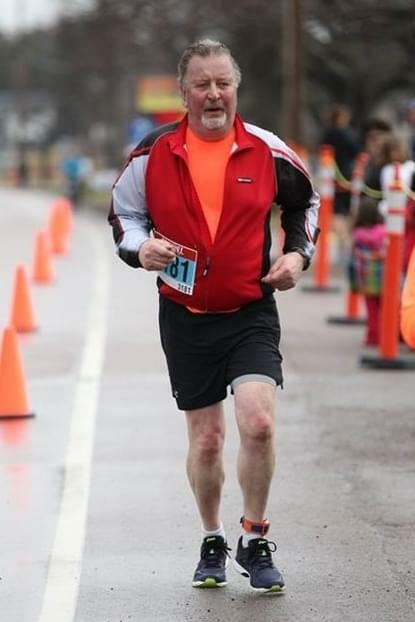 Last week in Memramcook it was the Demi Marathon Coeurs Chaud/Warm Hearts Half Marathon. In the half marathon it was super star Lee Roy of Bathurst leading the way in 1:17:23 ahead of Steve Handel of Dieppe (1:25:56) and Kevin Leblanc of Memramcook (1:27:12). The women’s half marathon went to Julie Belanger of Shediac in 1:53:09 while second place went to Guylaine Chiasson of Haute-Aboujagane in 2:09:54 and third to Riley Higdon of Saint John in 2:25:37. In the 10-km event the women were led by Sophie Comeau of St Charles in 43:17 followed by Andrea Burris of Truro in 49:07 and hometown runner Kristen Gaudet grabbed third place in 51:24. The men’s winner was Colin Burris of Truro in 40:26, Michel Leger of Dieppe was second in 46:38 and Mathieu Landry of Grand Barachois was third in 47:41. Mixime Aube of Dieppe won the men’s 5-km in 21:26 while Monica Leblanc of Memramcook was the top woman in the 5-km with a 25:05 finish. At the Demi-marathon de l’Acadie this past weekend, the always fast Mathieu Fortin of Caraquet was the fastest man in 1:24:49 followed by Jonathan Legault of Dieppe in 1:25:35 and Gary Kenny of Tracadie in 1:33:45. Nathalie Theriault-Roy of Beresford managed a PB for the women’s win in 1:36:12 ahead of Roxane Pelletier of Petit-Rocher in 1:36:22 and Nathalie Bovin of Bathurst in 1:36:39. . This week our Person on the Run goes to one of our Trail runners. Trail running is really taking off in New Brunswick and this week a new 8-week series begins in Rockwood Park thanks to Marc Gallant. Great idea Marc, thank you. Last weekend a traditional spring run came up with a great new twist that was literally felt around the world. The Brent Kelly 5-Miler added a new “virtual run” option that allowed participants anywhere in the world to participate where they are and receive a t-shirt and finishers medal. So in addition to the runners at the Irving Nature Park remembering Brent through their run, 39 runners from Mount Uniacke to Friuli Italy, from Borden to Belgium, even on Caribbean Cruise ships completed 5-miles all to honour the late Brent Kelly and to help raise money to keep kids active in our community. Six countries outside of Canada and six provinces within Canada were represented in the virtual run. The women’s race went to the very fast Erin Vringer of Saint John in 32:32 continuing her great running from last season. Second went to Renee Embree of Saint John in 35:22 and third to Sue Teakles of Sussex Corner in 38:23. The men were led by Evan Arseneault of Quispamsis in 28:01 ahead of Dean Strowbridge of Saint John in 31:28 and Nikolay Ryabkov of Fredericton in 32:13. Another new innovation this year was the Canicross event that has dog owners joined by their favourite pooch for a run. These guys were amazingly fast and would have been right up front in the regular 5-Miler. The women’s race was won by Sarah Peel of Hampton in 32:51 followed by Lisa McFarlane of Moncton in 34:28 and Amelie Aikman of Grand Bay-Westfield in 39:09. For the men it was Ryan Mairead of Saint John in 52:48 ahead of Jadon Mellor of Hampton in 54:48 and Todd Fraser of Nauwegiwauk in 1:35:42. That is a very impressive day of racing for dogs and runners alike. Congratulations to race director Marta Kelly on a great success around the world. In Sussex another innovator was hard at work as Alex Coffin offered the Sussex Swim Run to kick off the Triathlon season. The top man was Alexandre Boule of Saguenay in 28:34 followed by Martin Larose of Oromocto in 30:03 and Stephen Handel of Dieppe in 32:19. The women’s event went to Isabelle Turner of Oromocto in 36:17 followed by Frederick Morissette of Oromocto in 44:17 and Angelina Hermenier of Pearsonville in 47:38. It was great to see a mix of ages and abilities out enjoying this event. Last week our Person on the Run went to a very active Mom and this week it goes to a very active Dad. Shane Dickie of Quispamsis is a triathlete, a Dad of three young children (including twin boys), works full time and often is organizing training sessions for active friends on the weekend. This week he was 3rd in his age group at the Sussex Swim Run and is our Person on the Run. Great job Shane. Spring just doesn’t seem to want to catch hold but that isn’t stopping the athletes from getting into the race season. Last weekend of course was the Boston Marathon and the weather was brutal. As previously reported New Brunswick athletes certainly were up to Mother Nature’s challenge and our Province can once again be very proud of our athletes. A couple of my favourite stories are about athletes showing grit, like Colin McQuade of Riverview running in memory of his late Mom just weeks after both she and her brother passed away only weeks apart. Then pushing through the miserable weather to finish in 3:00:47. Or Paul Sands of Saint John still running great in his sixties and hit a 3:39:18 to qualify again for next year by over 30 minutes. How about Brenda Guitard, the running legend, getting it done with that permanent smile. But the story of the day for me comes from further back in the pack. From a man who doesn’t spend much time at the back of the pack judging by his 12 straight Boston Marathons. Steve Lohnes has been under the magic 3:00 barrier just a few years ago, but this year there were demons. He was very sick on race day but was determined to not break his streak so he gutted out a very tough 5-and-a-half-hour marathon in driving rain. Attacked from within by the flu bug, from without by the weather, but fortified in his character with the strength that would never let him quit, he got it done. And that my friends is exactly what the Boston Marathon is all about. Closer to home, the Run for Renee (R4R) had a clear crisp day for the first running of the season and judging by the number of personal best times the conditions were great. We don’t have the hometowns for the participants but let’s check the women’s results first. The top finisher was the amazing Erin Vringer in a quick 19:07 followed by Mary Bartlett in her first R4R in 21:21 and Kari Parsons just behind in 21:44. The men were very fast as Evan Arsenault led the way in 16:25 followed by Justin Young in 17:46 and Anderson Peters in 18:18. It was great to see runners from the early teens to the late seventies enjoying this event. This week our Person on the Run goes to Evan Doucet of Quispamsis for crushing Boston with a PB of 3:00:22 in the driving rain. Evan is a great race organizer and can burn up a course as well. Great work!